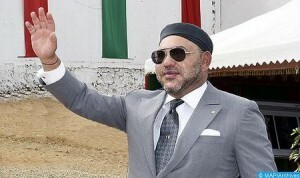 King Mohammed VI launched, on Monday in the rural commune of Tazouta in the Pronvince of Sefrou, several hydro-agricultural projects geared towards achieving sustainable management of natural resources and supporting rural development. In this respect, the Sovereign launched projects worth 5.5 billion dirhams to build the M’dez dam on the Oued Sebou river, protect irrigated areas in the plain of Saiss and upgrade the catchment area upstream the Allal Fassi, Zelloul and M’dez Ain Timedrine dams. These projects are designed to promote sustainable water management and preserve ecosystems in the region, notably in the fertile plain of Saiss, one of Morocco’s key agricultural regions. Located 58 kilometres to the southwest of the city of Sefrou, the M’dez dam will be built at a total cost of 1.5 billion dirhams for water storage purposes that will benefit areas receiving low levels of rainfalls. With a storage capacity of 700 million cubic meters- of which 125 million will be annually used for irrigation- the dam will also supply nearby centers with drinking water and enhance the protection of downstream areas from floods in addition to offering potential for hydroelectricity production. The project, to generate nearly 400,000 days of work, is expected to be ready by 2018. Part of the Green Morocco Plan, the project aiming to protect irrigated areas in the plain of Saiss will be achieved at a total cost of 3.8 billion dirhams. This project will be implemented on 22,000 hectares benefiting 4,800 farmers. It aims at compensating for the deficit in groundwater and improving land productivity. It will help create around 3,000 job opportunities. This project, to be completed by 2019, will be implemented through the setting up of a water intake on the left bank of the M’dez dam which will make it possible to transfer 125 million cubic meters of water to the plain of Saiss. The project also consists of building a 12-kilometer tunnel and a 78-kilometer long canal. In order to develop the Saiss plain, the High-commission for water and forests is carrying out a program for the management of the catchment area upstream the Allal Fassi and Zelloul dams and the M’dez-Aïn Timedrine compound, for a total amount of 225 million Dirhams. The 2015-2024 program will contribute to reduce the M’dez dam siltation, fight soil erosion, preserve the ecosystem, rehabilitate forest zones over an area of 71,500 hectares, break the isolation of the region’s rural localities and protect them against risks of floods. With this landmark project, Morocco is building on its long experience in the management of farming spaces and water resources to fulfill the goals set in the Green Morocco plan strategy which aims to turn the agriculture sector into a priority tool of socio-economic development.